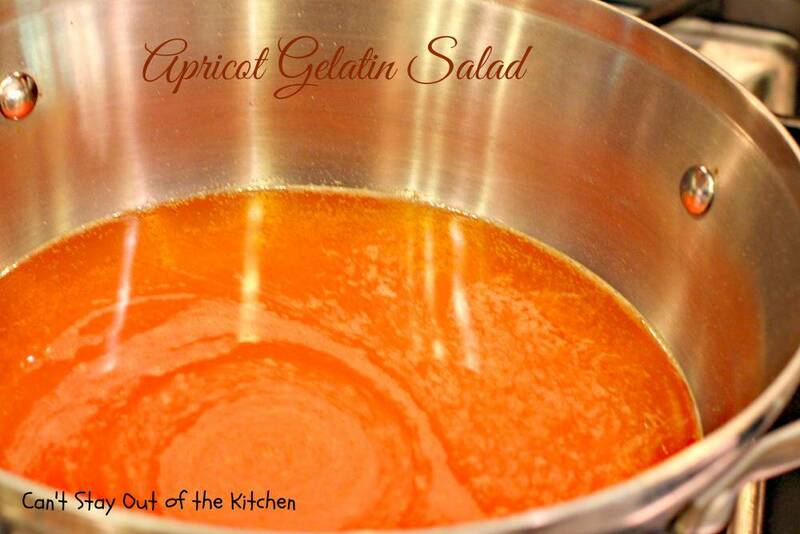 This luscious Apricot Gelatin Salad has been one of our favorites over the years. 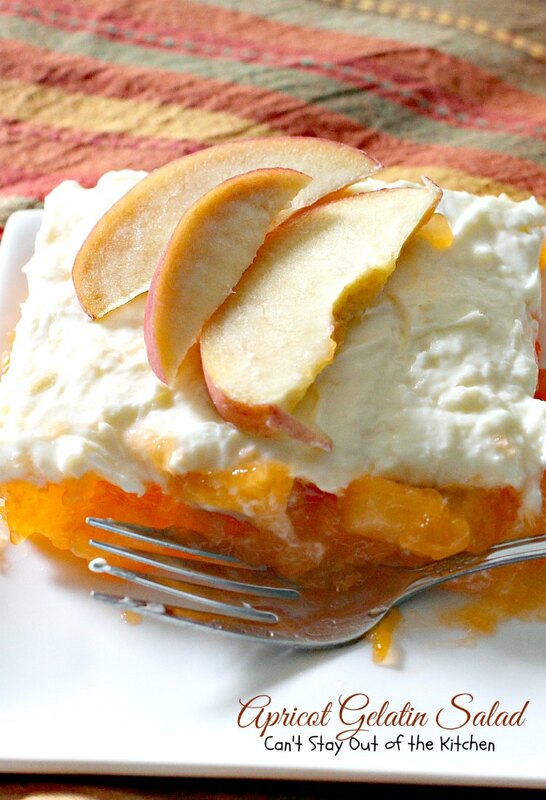 It’s made with apricot Jello, marshmallows, bananas, crushed pineapple, and has a marvelous cream cheese topping on top. Wow! Talk about wonderful. 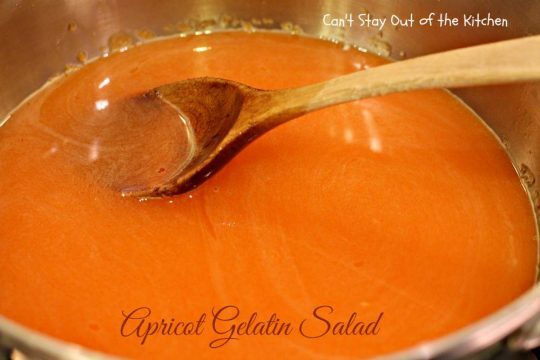 It’s a great salad to take along to potlucks or have when you’re having a cookout or barbecue and want something cool to eat rather than heating up the kitchen. It’s also one of those fluffy-type salads (because of the topping) that’s really enjoyable to sink your teeth into. 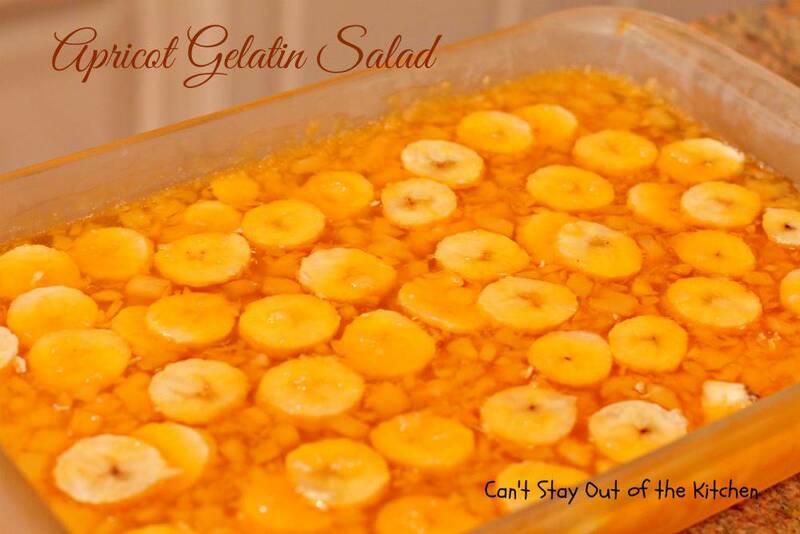 About three decades ago, Bonnie Rodriguez brought this Jello salad recipe to several potlucks at our church. I asked her for the recipe and she gladly provided it to me. The instructions were somewhat unclear so the first time I made this on my own I just mixed the topping ingredients together not realizing you had to cook them to get them to thicken. So I made that notation in my cookbook and the second time I made it, the recipe turned out perfectly. While my pictures show this salad decorated with peach and banana slices, I did that only for decoration. The original recipe doesn’t have anything on top of the cream cheese topping (nor does it need anything else). Gelatin recipes have sort of fallen out of favor over the past decade or so, although they were really popular between the 1950s and 1980s. This recipe is really exceptional. 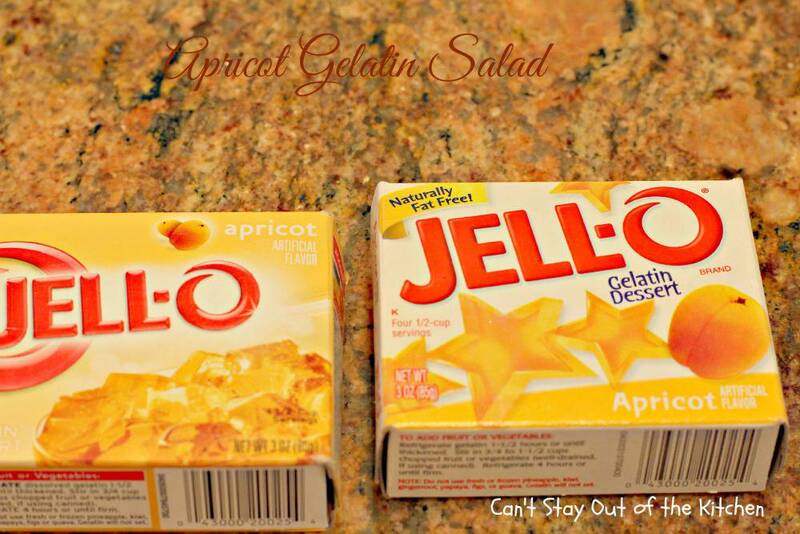 In order to get my Jello recipes to thicken, I usually put them in the freezer for 30 minutes to an hour–depending on if they need to be firm or just thick enough to stir in more ingredients. Any Jello recipe like this one which has a topping must already be completely set before putting any kind of topping on top or the topping will just dissolve into the Jello ingredients (which you don’t want to happen)! 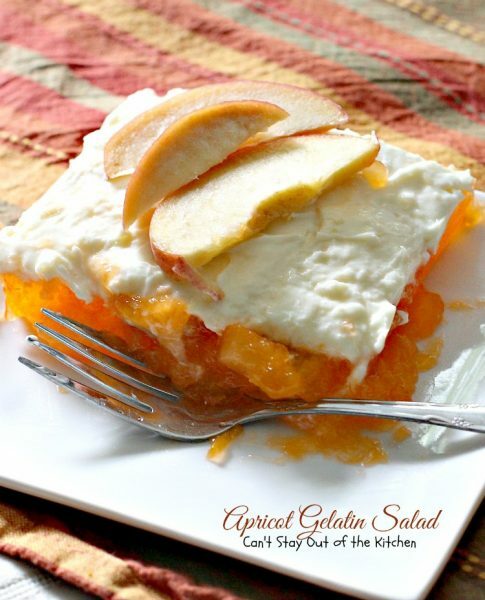 If you’re looking for a great salad recipe for picnics or summer parties, then look no farther than this appetizing Apricot Gelatin Salad. Your family and your guests will enjoy this great recipe even if they’re not used to eating Jello-type salads. Apricot Gelatin Salad is so refreshing–especially in the summer. 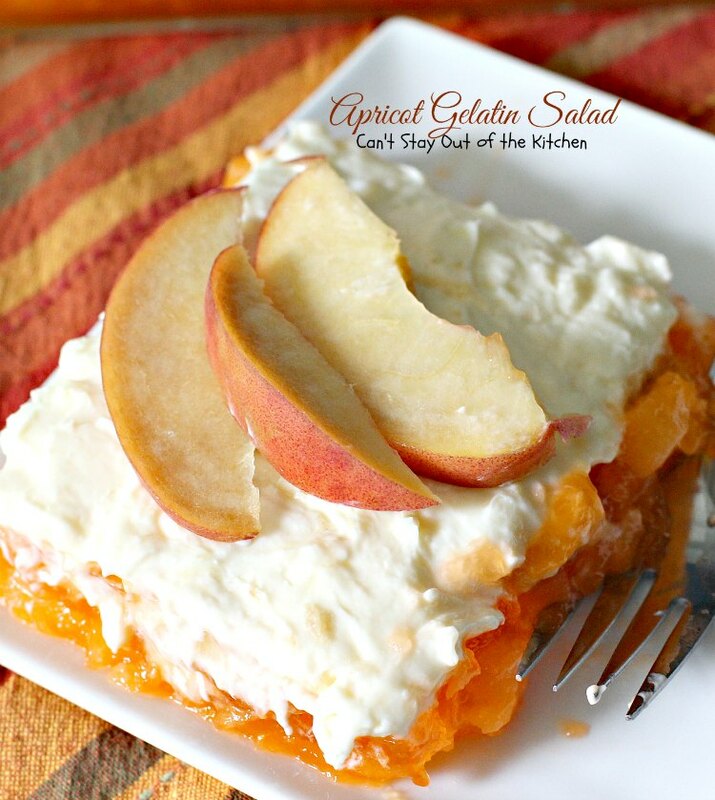 The hardest thing about this recipe is finding apricot Jello! Only certain grocery store chains carry it. 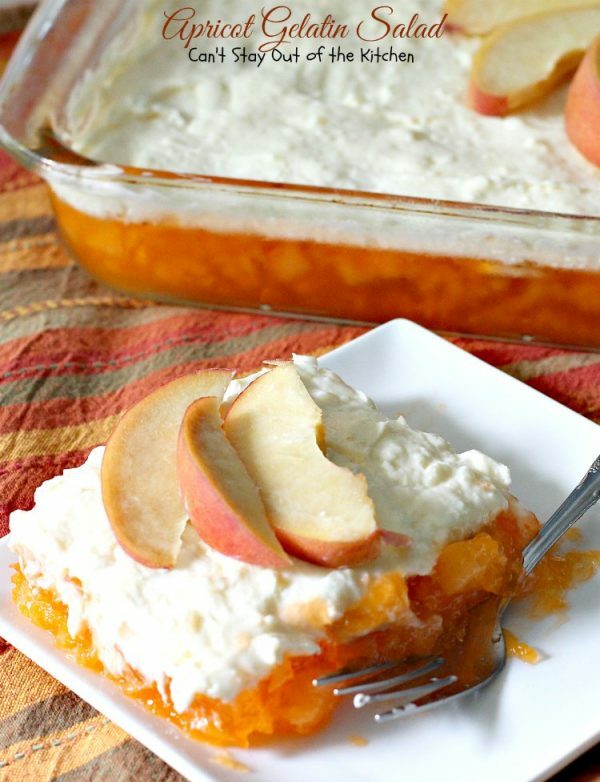 This recipe is also good made with peach Jello. This close up shows the texture of the Jello and the amazing cream cheese topping. Apricot Gelatin Salad is a great recipe for picnics or potlucks because it provides at least 12 large servings. You will need two boxes of apricot gelatin. 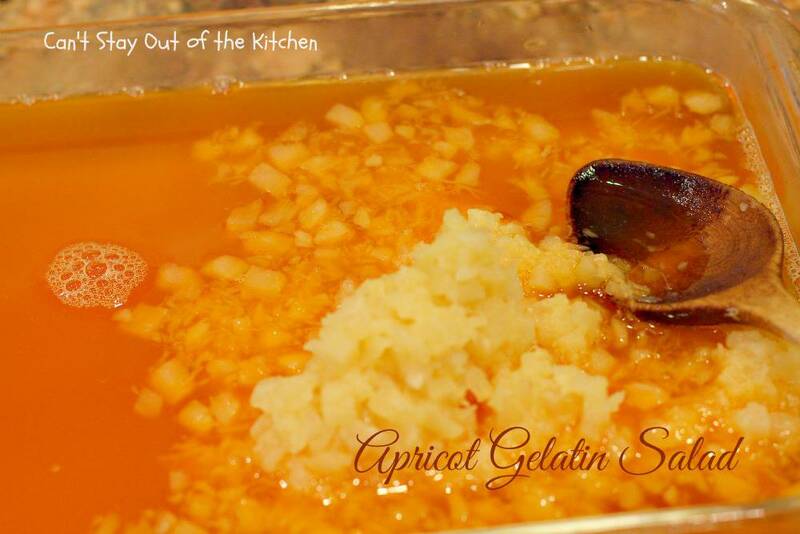 Jello is the only maker of this flavor gelatin. You will not be able to find a knock-off brand for this flavor. Place hot water in a saucepan. Heat over medium heat. 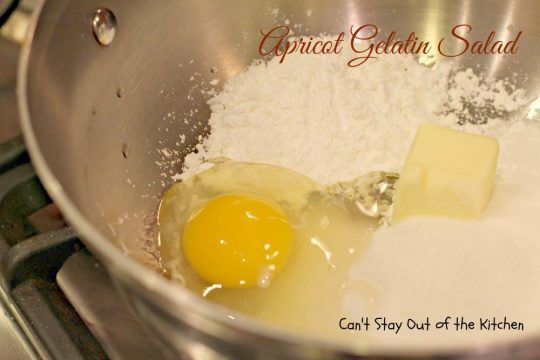 Add the two packages of apricot Jello and stir to combine. Add a cup of miniature marshmallows and continue stirring until marshmallows are completely dissolved. Continue stirring over medium heat. The marshmallows have finally dissolved. Add cold water. (Not tap water.) This is cold water from the refrigerator with a couple of ice cubes in it. The original recipe says this should thicken a little. Mine NEVER has! Add cold water to the apricot gelatin mixture and stir to combine. 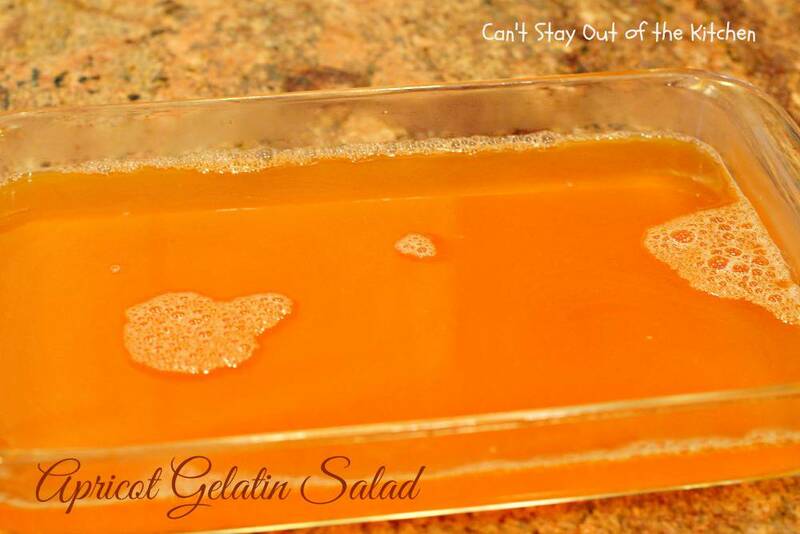 Pour mixture into a glass 9×13″ baking dish. 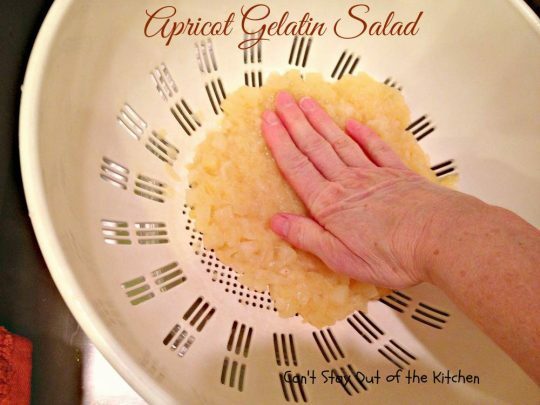 Place a large bowl underneath a colander and press juice out of a can of crushed pineapple reserving the juice. Here’s the reserved pineapple juice. 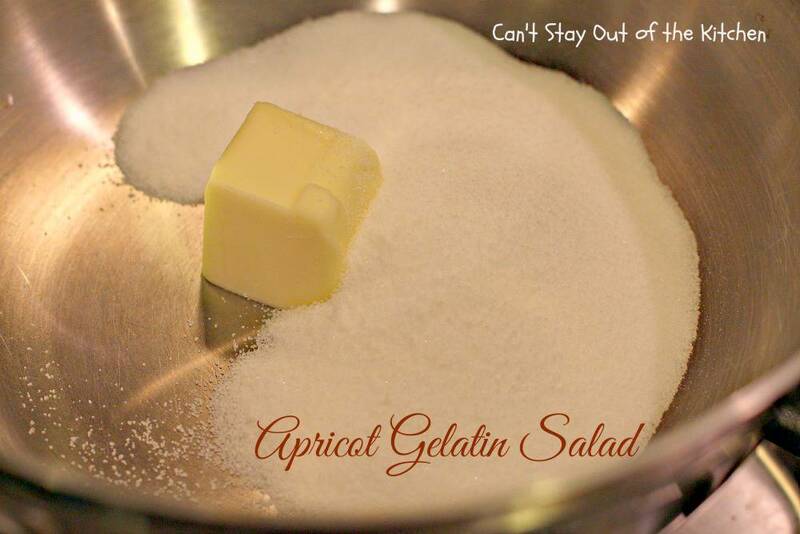 Set it aside; you will need it for the topping. Stir crushed pineapple into the apricot gelatin mixture. Add sliced bananas and stir ingredients to combine. Place in refrigerator for 30 minutes to an hour (mine took an hour) until mixture is set. 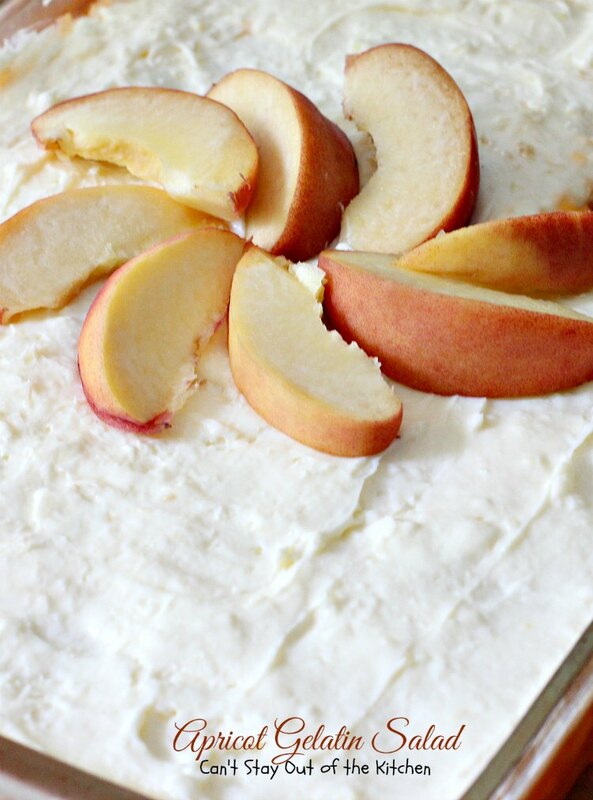 Meanwhile, make Pineapple Cream Cheese Topping. Place butter in saucepan. Add sugar. Add egg and pineapple juice. Turn on low to medium heat and whisk all the ingredients together. Continue whisking and cooking until mixture starts to thicken. I usually cook it about two minutes after that time whisking continuously. Add cream cheese to thickened pineapple juice mixture. Continue whisking until cream cheese dissolves into the remaining ingredients. Make sure you’re heat is not too high. You don’t want to scorch the mixture. Here the cream cheese has finally dissolved into the remaining ingredients. You can see how nice and thick the topping gets. Allow topping ingredients to cool completely. 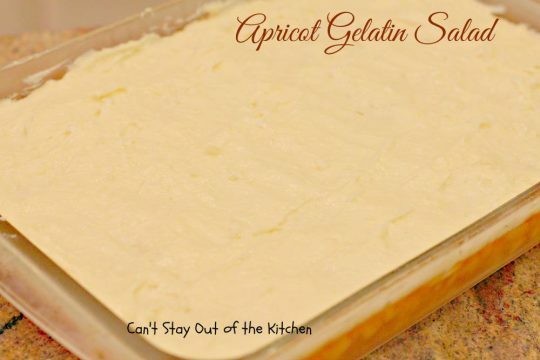 It took about an hour in the freezer for my Apricot Gelatin to set up firmly enough that I could spread the topping on top. 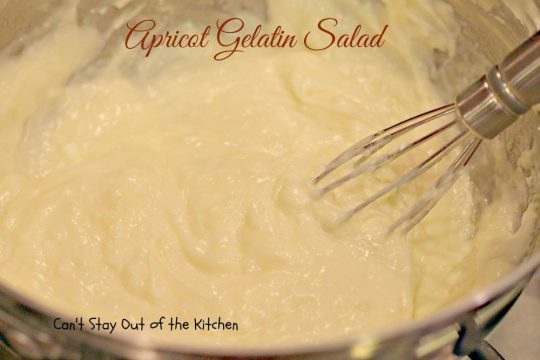 Spread Pineapple Cream Cheese Topping over top of the Apricot Gelatin Salad in a somewhat thin layer so the whole salad is covered. 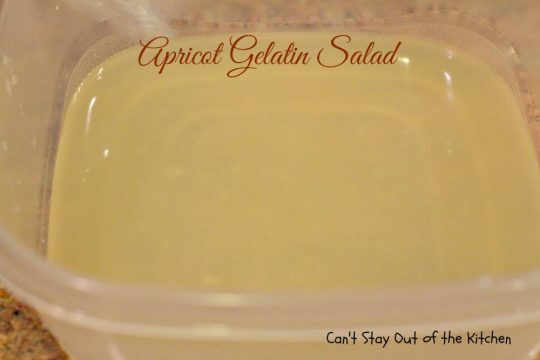 Here, I’ve covered the gelatin with the topping. 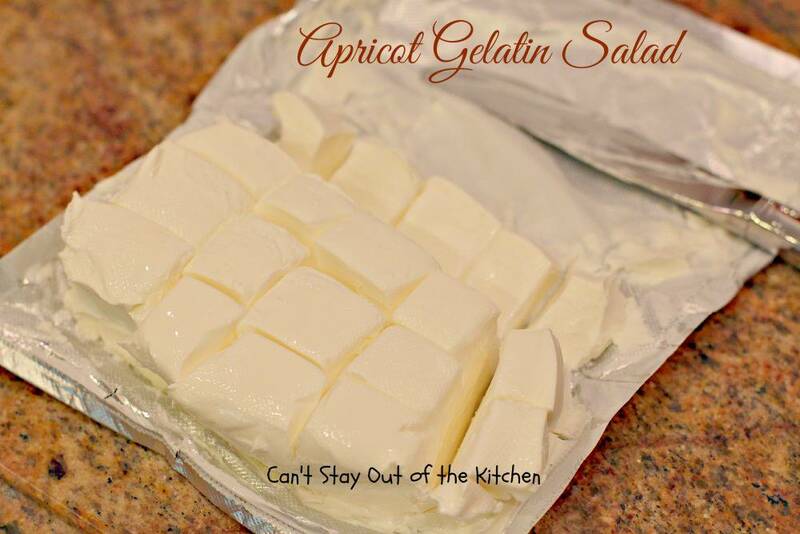 Refrigerate for a few hours until ready to serve. Apricot Gelatin Salad is perfect for summer holiday fun, but it’s also a great salad to make for family get-togethers during the fall and spring, too. 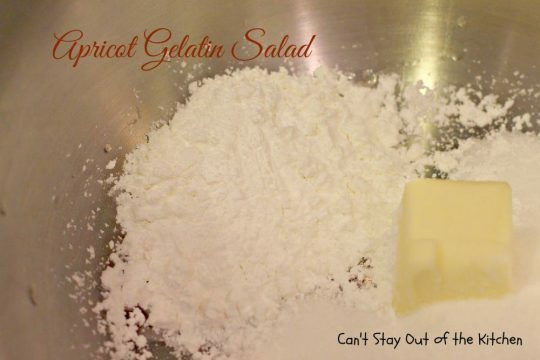 If desired, you can garnish the gelatin with fruit. We love this salad! It’s so refreshing during hot, summer days. The marshmallows are dissolved with the Jello but they provide a nice taste in addition to the apricot jello base. Pineapple juice is added to the cream cheese infusing the topping with a great flavor. Marshmallows, bananas, apricot jello and pineapple make an unbeatable combination. 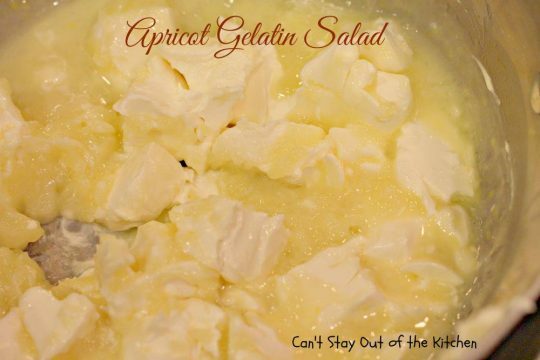 Add the pineapple-sweetened cream cheese topping, and you have an irresistible salad everyone will love. 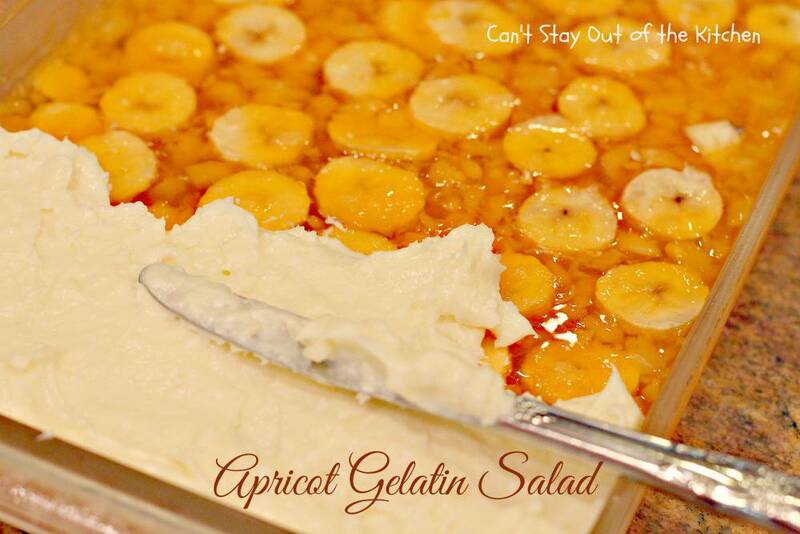 Apricot Gelatin Salad is made with apricot Jello, marshmallows, bananas, pineapple & a scrumptious cream cheese topping that is amazing. 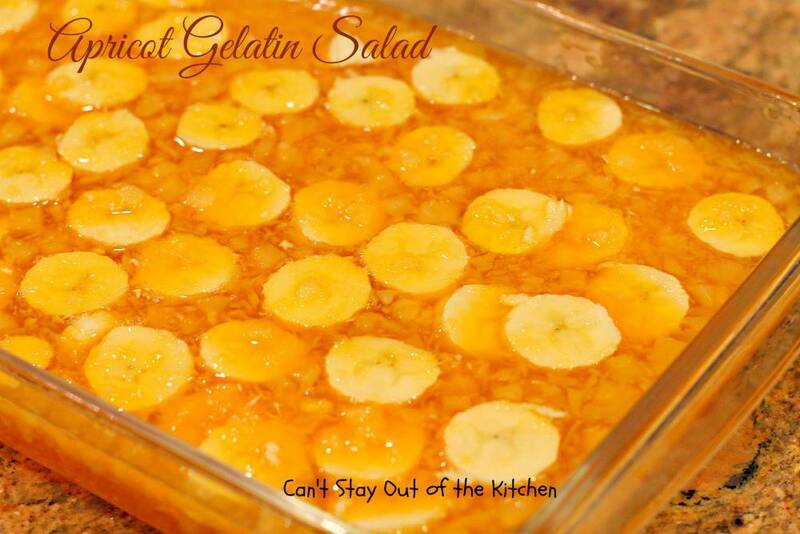 This delicious gelatin salad tastes more like dessert! 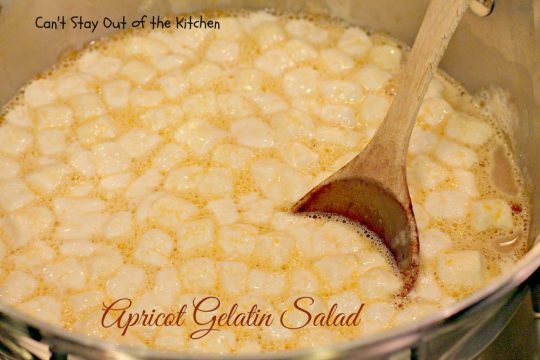 Heat apricot gelatin, hot water and marshmallows until marshmallows are melted. Add 2 cups ice cold water. Let this thicken. (I have found it never really thickens much). Pour into a 9x13” glass baking dish. Add bananas and drained crushed pineapple and stir well to combine. Put in the freezer for about 30-60 minutes until mixture thickens and sets. Spread cooled topping over top of gelatin and place in the refrigerator to set. 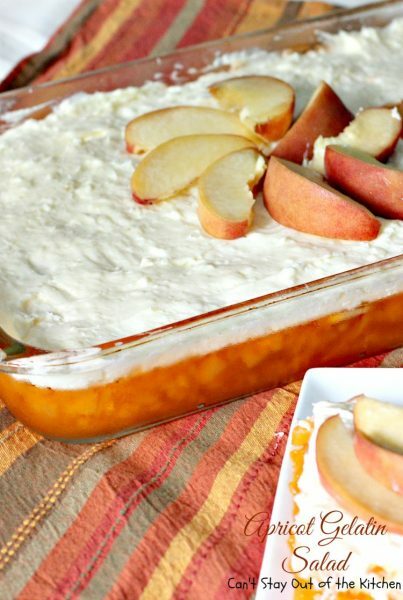 Put all ingredients except cream cheese in a saucepan and cook on medium heat until mixture begins to thicken. Add cream cheese cut into chunks. Stir with whisk until cream cheese dissolves. Spread cooled topping on gelatin once gelatin has set well. NOTE: I normally don't garnish this salad with fruit. But you can add whatever you desire on top of the topping. 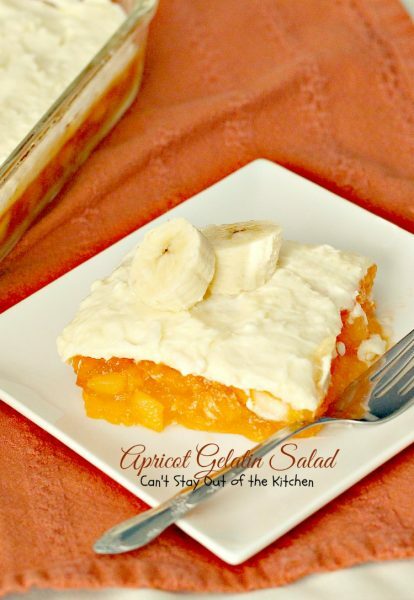 NOTE: The allotted time for this recipe do not include refrigerator or freezer time necessary to set the bottom layer before adding the topping. 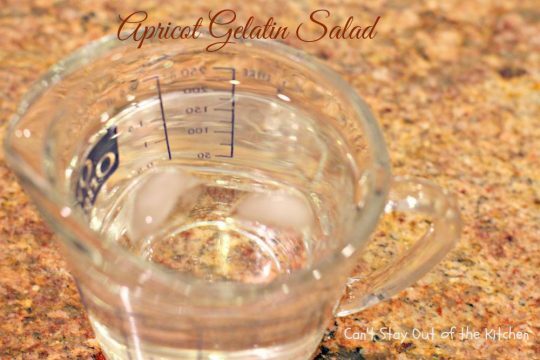 Pour into a 9×13” glass baking dish. I normally don’t garnish this salad with fruit. 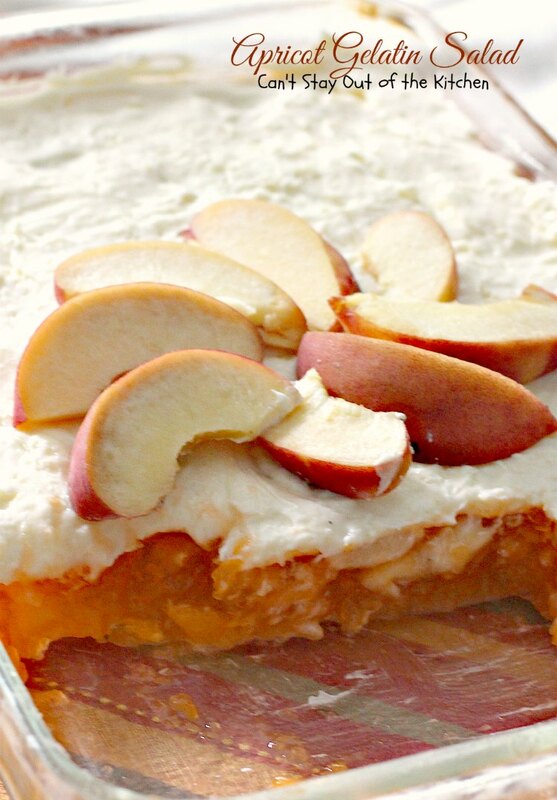 But you can add whatever you desire on top of the topping. 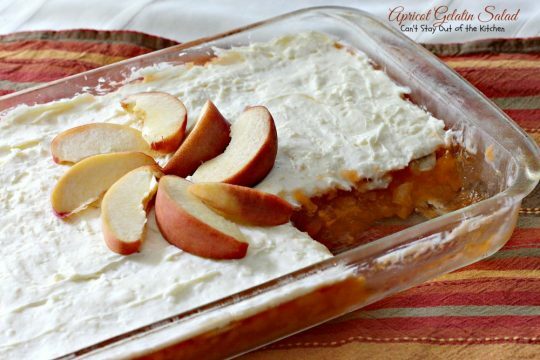 The allotted time for this recipe do not include refrigerator or freezer time necessary to set the bottom layer before adding the topping. Try this salad out the next time you have company or your neighbors over for a backyard barbecue. Yum. 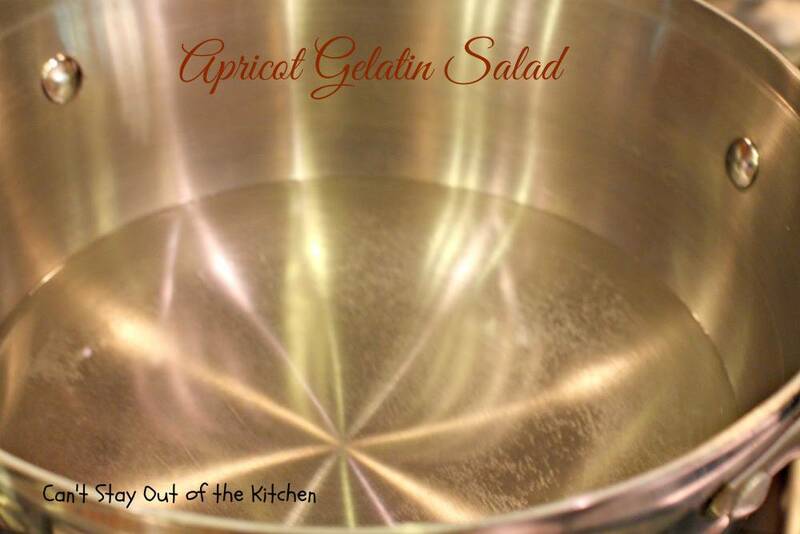 Apricot Gelatin Salad is such a satisfying fruit-gelatin type salad. We find it the perfect salad to serve any time of the year, but it’s extra special for summer holiday fun. I’ve been looking for this recipe, my mother had a recipe box an she threw it out, and with it this recipe! She called it Sandee’ s Jello casserole. I have ha it like this an also with cool whip added to th frosting, usually around summer holidays to lighten it up a bit. The pineapple is a must, but bananas are interchangeable with blueberries, drained mandarin oranges or other non-watery fruit! Thank you!!! Wow, I love the idea of using it with blueberries, mandarin oranges or other fruit. 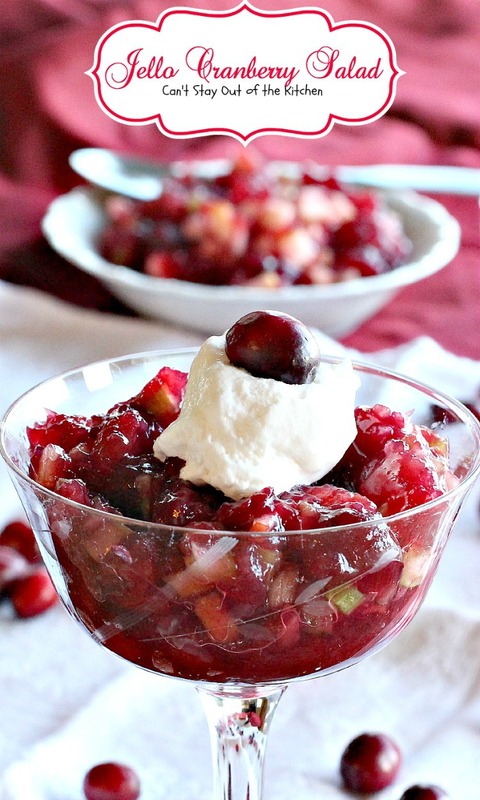 This is one of those recipes I’ve never fooled around with much, but I will the next time I make it! I’m so glad you have the recipe in time for the holidays, Bethany. Enjoy. I bet it’s delicious that way too! Thanks for stopping by, Diana.